2 HOMES FOR THE PRICE OF 1-MAIN HOUSE HAS 3 BR'S, 2.5 BATH WITH 2.5 CAR GARAGE. TOTALLY REMODELED IN 2006. NEW WINDOWS, HARDY BOARD SIDING, METAL ROOF, TILED AND LAMINATE FLOORING, NEWER A/C, GRANITE COUNTERS IN KITCHEN, 2 PANTRIES, BREAKFAST NOOK, FORMAL DINING ROOM, LIVING ROOM WITH FIREPLACE. FLORIDA/SUN-ROOM THAT OPENS TO GUNITE POOL + LANAI. MASTER BEDROOM HAS BATH WITH WALK IN SHOWER, 2 WALK IN CLOSETS + ADJOINING EXERCISE ROOM OR MAKE IT A NURSERY OR OFFICE. 2ND HOME HAS NEW WINDOWS, HARDY BOARD SIDING + METAL ROOF. NEW FLOORS AND COUNTER TOPS. 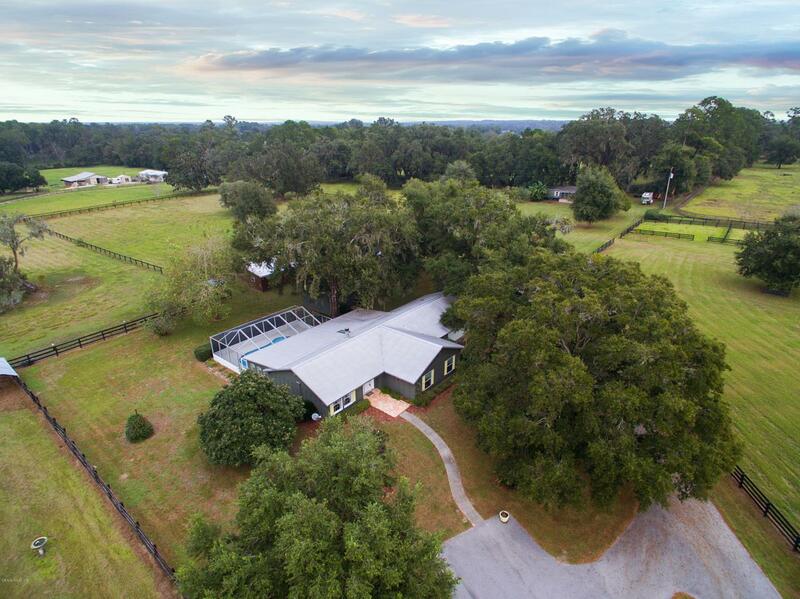 THIS HOME IS IDEAL FOR YOUR TRAINER, GROOMS FARM HELP OR EVEN IN LAWS. 9 STALL CENTER ISLE BARN, 2 STALL BARN WITH FOALING STALL, FEED RM + TACK RM. EQUIPMENT BARN + SHOP. 5 LARGE PADDOCKS WITH AUTOMATIC WATER. 4 BOARD/WIRE FENCEMAIN HOUSE WIRED FOR A GENERATOR AND FULL RV HOOKUP AS WELL. DON'T MISS OUT ON THIS FABULOUS OPPORTUNITY!! Listing provided courtesy of Kevin Sherlock of Sellstate Next Generation Realty.